Home > Misc. > Stop Rewarding Bums Who Roam Our Streets! Stop Rewarding Bums Who Roam Our Streets! Lyndon Johnson declared war on poverty, but after a generation of taking from the haves and giving to the have-nots, we have an army of “poor” people, many of whom are roaming the streets of our major cities. Some are drunks, some are mentally incompetent. But most of them are making careers of being bums. Everyone has the same amount of time; almost everyone has some ability. And everyone has to eat. People who can work but don’t are parasites. For 50 years, government has rewarded the bums and penalized the productive. But don’t blame the poor, “it is not their fault.” I have never heard a government worker admit that even one person was hungry and out of work because he was lazy. Some of us are aware that the kinder you are to some of the poor, the lazier they become and the more demanding. Anytime a person receives money he did not earn, there is somewhere a person who earned money he did not receive. Many welfare mamas are, as the old-timers used to say, very “fleshy,” sucking on cigarettes, with booze and soft drinks in the fridge, feeding their faces with fudge as they watch the color TV. Many of the street people are not that affluent, since they do not have a place to live. I suppose we could build each one a house and provide unlimited food stamps, but that’s not the answer. It is impossible to help people without character, and although I will be inviting the slings and arrows of outraged liberals, most street people are without character. I don’t owe the street people anything, although my Christian conscience will demand that I help when possible. The poor don’t have a “right” to what I produce. If they do, then I am their slave. Anytime a person receives money he did not earn, there is somewhere a person who earned money he did not receive. That is thievery, and Government can make thievery legal, but never just. *Place all incompetents in asylums or with their families. *Make drunks work during the day and be jailed at night. *Make families of the elderly and sick care for them or be fined. *For the elderly and sick without family, provide help from public (taxpayer) funds—reluctantly. *For the healthy bums, give each a suit—or dress—three nights’ lodging and food, and then push them into the streets with a warning there would be no second time. *Then I would get the government off the back of churches and non-profit groups that want to help. We have heard enough talk or rights. It’s time to demand responsibilities. This nation of gutsy pioneers has turned into a nation of grabbing parasites. And everyone must realize they must take care of themselves. They must understand: welfare is spelled S L A V E R Y and this womb-to-the-tomb guarantee from government is illegal, immoral and illogical. And we taxpayers have had it. This semi-slave state will come tumbling down around our heads, at which time the politicians and parasites will all starve together. Street people and others must understand that angry taxpayers are closing the welfare window. 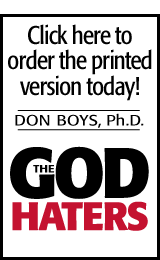 Copyright 2005, Don Boys, Ph.D. I agree with you. If you don't work, then you SHOULD NOT EAT! Straight from the Bible! I have no idea where you got your Ph.D., but I am sure glad you don't have the power to do a fraction of the things you think are "right." I don't think you have much common sense and I mean this honestly. Your logic seems to have evolved in a closed vestibule of a right wing fundamentalist Christian's mind. While some of your musings are amusing, others are not. I truly believe, that if Jesus where to appear before you as he likely looked in the time when the Middle East was full of MIDDLE EASTERNERS, you'd probably tell him to go back to Mexico. Don't worry, I don't think he'd recognize you as a Christian either.